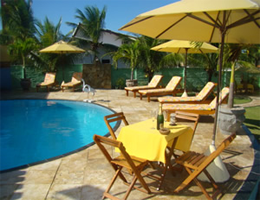 Casa Dona Rosa, Enjoy Brazil in style! 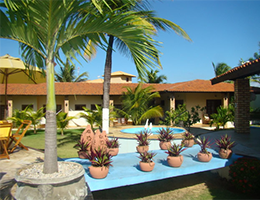 In the village Cumbuco lies Casa Dona Rosa, a small cozy guest house from the couple Gerrit and Roos. You stay here based on bed and breakfast in cozy, well-kept rooms with your own terrace and hammock. The rooms are spaceous and air conditioned, there is a kingsize bed and a luxurious bathroom. Ofcourse there is free Wi-Fi. On the spacious terrace at the beautiful swimming pool you can relax with a drink from the poolside bar. On request can be provided for a Brazilian barbecue. All this at 150 meters from the beautiful beach and the center of Cumbuco guarantee for a wonderful, relaxing holiday in vibrant Brazil. To give an impression of all the wonderful facilities and opportunities, Casa Dona Rosa has a beautiful collection of photos ready. Take a look!